As you prepare for your new year, I hope you can learn from my many, many mistakes as a first year teacher. My teacher friend Eric said it best, “Teaching is a multi-facted skill: planning, organization, execution, etc. Nobody is good at all or even most of it right away. Know that each year is going to refine your game a little bit more, and focus on small things to improve.” That is a relief because going into year five, I am hoping that I won’t rely on the recycling bin as my filing system. Surely I’m not the only one. 🙂 Here are some tips that I wish I could go back to 2012 and tell myself as a first year teacher. For some reason, before my first year of teaching I was really concerned how my handouts would get hole punched. The school copier didn’t have a hole punch setting, so teachers had to hole punch copies themselves. Oh my gosh– what a huge waste of time. Without asking anyone anything, I went and bought 6 hole punches before the year started. (Hole punchers are not cheap.) The hole punches would go on each student table, and I would teach students to hole punch papers themselves. This all seemed very brilliant until the day prior to the first day of school. I was working in the copy room when a fellow teacher pulled out a huge device that hole punched all of her handouts in about 2 seconds. I was enraged! Why did no one tell me about this magical device that hole punched more than 5 pieces of paper at once? The real question was — why didn’t I ask anyone about this? I was so concerned that I didn’t stop and ask experienced teachers around me how they accomplished something that stressed me out. Lesson: ask for help. Rely on the experiences of others. If you have an idea, run it by someone else before jumping all in. It will save you time, money, and most importantly your sanity. Your projector shut off and is taking one million years to reboot? It’s going to be ok. Someone just threw up in your classroom? It’s going to be ok. Your principal walks in and your fly is down and a student announces this small fact to the class. It’s going to be ok.
Because you are in a room with others humans, much less small humans, life is going to get a little messy. Students are going watch your reactions to these situations. If you freak out, they will freak out. If you are calm and brush it off, they will too. Do not sweat this small stuff. However, as a classroom teacher, you must sweat the small stuff. There are some instances that you could probably ignore, and no one would really notice, but you must address. For example, if a student is unkind to another student, you can stop everything to address it. Do not blow this off. In my classroom, building character trumps teaching content, so if a situation arises where we can talk as a class about showing integrity or building each other up, I will spend the time doing it. If I need to apologize for snapping at a student, I will do it. Students should know that you will not turn a blind eye to bullying, leaving students out, or rudeness in any form. Oh, you were getting help? How convenient that your helper is across the room, your best friend, and someone who you outperform on every single assessment? Are you saying that the 4 people I strategically put at your table were not capable of helping you? Get back to your seat asap. The teacher down the hall from me hates the sound of binder rings when they open and close with a passion, so she came up with a routine in her classroom that everyone opens them on the count of 3 and everyone closes them on the count of 3. Seems nutty, but it is better to own up to being a nut, rather than become a nut involuntarily because all your can hear when you are trying to fall asleep is binder click nonsense. Whatever you do, do not tell students that pen clicks annoy you. I made this mistake and literally as I was telling them this, the amount of pens that were being clicked grew exponentially! WHAT THE HECK. This is an area to just ignore. There are other techniques to handle pen clicks/pencil drumming/mechanical pencil disassembly, but that is an entirely different post. You have all heard this before. You must make time for yourself. You must rest. You must (fill in the blank). This is harder said than done! Teachers typically are people who are crazy and will actually spend 36 hours cutting out letters because they are cute. I can say that because this year, I made my own letters for all of my bulletins boards. And between designing, coloring, cutting, and laminating, I easily could have read 3 books, learned Latin, and cleaned out my car. Craziness aside, no one is better at recharging than my principal. When I interviewed, she told me that she would rather her teacher get 8 hours of sleep over perfectly created materials. I was like HIRE ME NOW. You can only be effective if you are rested. You can only be effective if you take time for yourself. It will be amazing. You will learn SO much. And it will get so much better! Good news, you are only a first year teacher once. Thank you for this! I will be a first year 4th grade teacher this year! I am not sure what to expect, after having a rough time student teaching in 4th last fall (my CT and I had very opposite classroom management styles). Luckily, I was able to be a classroom teacher for two separate 8 week maternity leaves this past semester, where I was literally thrown into the rooms last minute. I am hoping (and definitely praying) that this will help me transition into my own classroom! Hi Chelsea! Congratulations on your new job! It will for sure be a challenge but just remember that you don’t have to be perfect and to give yourself lots of grace (especially the first six weeks). You got it! Let me know how it goes! Thank you so much for taking the time to bestow advice and uplifting guidance to First Year Teachers. This is such an encouraging, straightforward and delightfully humorous approach to not only prepare teachers but give them positive self-talk reminders for the joys and stretches of their first year teaching. Thank you for softening your delivery with humor but holding up salient points. I would be very grateful if you could send me an email with more information about how you scaffolded your Substitute Binder. Thank you in advance for your consideration! Hi Brittany! Thank you for your kind words. You might want to print it and read it on the hard days. I still have a binder of notes from students and other encouraging messages to keep and reference. Can you email at noelle@maneuveringthemiddle.com with your specific questions about the sub binder? Thanks! What is this magical hole puch that you speak of? Haha! Also, I loved every word of this! Thank you. This is one of the better blogs I have read on first year teacher advice. Thank you for your kind words! I hope you have a terrific first year! This will be my first year teaching. I will be teaching 4th-Grade Language Arts. My sister/mentor has been teaching for years and now is a ELAR specialist. I plan on asking her tons of questions. She sent ms this link to read what you wrote. I loved every bit of it. Thank you for the ideas and tips! Congratulations on your new job! I hope you have a fabulous year. You will learn a lot and just know it only gets easier. 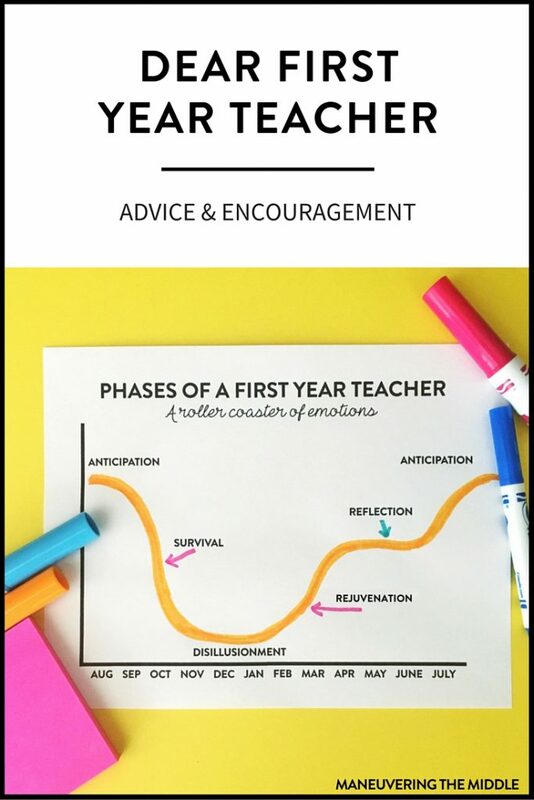 As one part of a husband- wife team coming into their first year of teaching, this article had very helpful advice for both of us before starting! Thank you for your kind words! I am so glad that you found it helpful. I hope you have a wonderful first year! I really enjoyed this article. I am currently in the TAPP program and we have been discussing this. I am excited about my first year teaching middle school science. I recently discovered I will be teaching 6th and 7th grade. I must establish procedures so that content can be taught in an engaging environment. Thank you so much and I look forward to more of your blogs! Thanks so much for your kind words! I hope you have a fabulous year! Fantastic blog post. I really connected with it and appreciated the humor in the reflection. 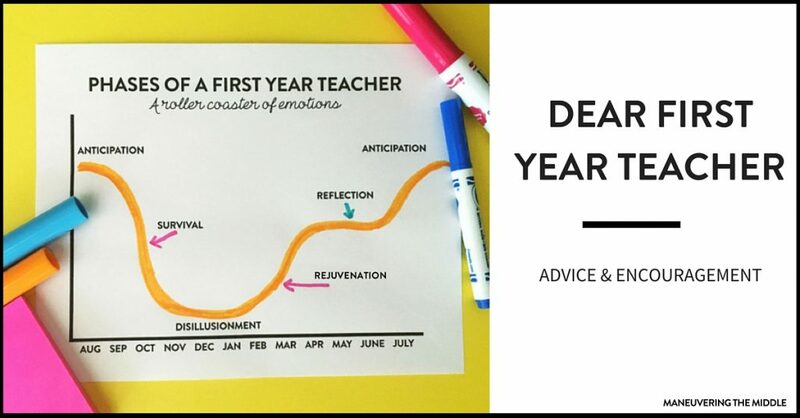 I think it’s fantastic advice not only for the first year, but the second and third year teacher … and any time you switch schools. Last year was my first year teaching at a school that served a very challenging community of learners. I actually had to tape off spaces on the floor for students to sit, otherwise they had no regard for personal space and would engage in dangerous behaviors like trying to choke each other, stab each other, or jumping on each others heads. (Sadly, I am not exaggerating.) Taping off spaces and labeling each space as to which child would sit there was a classroom management technique that saved my sanity. We used those spaces not only when we were gathered together for stories, but also any time we needed to line up to transition to another location. Everybody in their space with no part of their body touching another person. I think I probably thought about quitting at least half a dozen times throughout the year, and a few of those times actually started carting my personal belongings out to my car. There were many days when the last student left and I closed the door and cried. The saving grace was fantastic co-workers. So many times they saved my sanity and reassured me, and of course there were days when the tables were turned and I found myself reassuring them. Somehow we all made it through by leaning on each other and learning from each other. Other teachers at the school are a teachers’ greatest resource, and we need to learn to reach out and connect without the fear of judgment from each other. Wow, thank you for your kind words and for your love for teaching and your students! I think we can all relate to the need for supportive and uplifting coworkers…they really do get us through the tough days. Thank you again for all you did and continue to do for your students. You are making an impact!